Background and objectives: Information on the time course of serum calcium levels after renal transplantation is scanty, especially in the early posttransplantation period. Both the abrupt cessation of calcium-containing phosphorus binders and vitamin D (analogs) at the time of surgery and the recovery of renal function may be hypothesized to affect serum calcium levels in this period. Design, setting, participants, & measurements: In this prospective observational study, biointact parathyroid hormone, calcidiol, calcitriol, calcium, and phosphorus levels were monitored in 201 renal transplant recipients at the time of transplantation and 3 mo thereafter. In addition, the serum calcium nadir and peak in each individual patient within this time frame were identified and the urinary fractional calcium excretion was determined at month 3. Results: Serum calcium levels followed a biphasic pattern with a significant decline during the first postoperative week, followed by a significant increase. High pretransplantation parathyroid hormone levels protect against hypocalcemia within the first postoperative week but put patients at risk for hypercalcemia later. These complications, occurring in 41 and 14% of the patients, respectively, most probably reflect inappropriate calcium release from the skeleton, rather than inappropriate renal calcium handling. Conclusions: Our data indicate that both hypo- and hypercalcemia are prevalent in the early posttransplantation period. Pretransplantation parathyroid function is an important predictor of posttransplantation calcium levels. Over the years, several investigators have been studying calcium (Ca) metabolism in renal transplant recipients (1–7). Hypercalcemia is reported in up to 66% of the transplant recipients and typically occurs within the first 3 mo after transplantation. Most of the studies that have investigated posttransplantation Ca metabolism, however, were hampered by limitations such as cross-sectional design and small sample size and, in addition, were performed before the publication of the National Kidney Foundation clinical practice guidelines for bone metabolism and disease in chronic kidney disease (8). The latter guidelines triggered a paradigm shift in the treatment of secondary hyperparathyroidism, in a sense that the focus of attention was shifted from control of parathyroid hormone (PTH) levels toward prevention of cardiovascular calcification. As a result, Ca-containing phosphate binders, calcitriol supplements, and high-Ca dialysate baths have been increasingly replaced by non–Ca-containing phosphate binders, novel vitamin D analogs, and low-Ca dialysate baths, respectively. The impact of this paradigm shift on posttransplantation mineral metabolism has not yet been studied. Moreover, information on the time course of serum Ca levels in the immediate postoperative period is scanty or even nonexistent. It may be hypothesized that the abrupt cessation of the Ca-containing phosphate binders and vitamin D supplements at the time of transplantation will induce temporary hypocalcemia in this period, especially in patients with an impaired mineral-mobilizing capacity. The aims of this study were (1) to determine the early posttransplantation natural history of Ca metabolism in recipients of a renal allograft, (2) to study the determinants of serum Ca levels in the early posttransplantation period, and (3) to compare the natural history of serum Ca levels in this cohort with the natural history observed in historic control subjects. For this purpose, parameters of mineral metabolism and renal Ca handling were prospectively collected in a large cohort of renal transplant patients who underwent successful grafting between 2004 and 2006. Patients who were included in a previous observational study served as historic control subjects (1). We performed a single-center, prospective, observational study that included recipients of a single kidney graft who underwent transplantation at the University Hospital Leuven between 2004 and 2006. Only patients who consented to participate in our protocol biopsy program were eligible for inclusion. Patients with a nonfunctioning graft at month 3 and patients with a history of a previous parathyroidectomy or patients who were on calcimimetic therapy at the time of transplantation were excluded. The study adhered to the principles of the Declaration of Helsinki and was approved by the ethical committee of the Catholic University of Leuven. All patients provided informed consent. Serum samples were collected immediately before transplantation (random, nonfasting) and at month 3 after transplantation (fasting). Upon arrival at the laboratory, the blood samples were centrifuged at 3000 rpm for 10 min, aliquotted, and stored at −80°C until analysis. At month 3 after transplantation, also 24-h urine and fasting urine samples were collected. Urine samples were shaken, aliquotted, and stored at −80°C until analysis. Biochemistry data collected in between were extracted from the electronic medical files. Calcitriol and 25-hydroxyvitamin D3 (calcidiol) levels were measured using a RIA (9,10). Serum concentrations of PTH were determined by an immunoradiometric assay (IRMA), as described elsewhere (11). In contrast to most other commercially available IRMAs for PTH, this assay detects full-length human PTH but not N-terminal truncated fragments and thereby resembles recently introduced third-generation PTH IRMAs (biointact PTH or whole PTH). This also explains its lower normal range of 3 to 40 pg/ml (ng/L). A comparison with the PTH 1-84 assay from Scantibodies Inc. in a large cohort of hemodialysis patients (n = 98) showed a good correlation (R2 = 0.92, y = 0.91x; data not shown). Specific guidelines on the target range of PTH in renal transplant recipients are lacking. Applying current Kidney Disease Outcomes Quality Initiative (K/DOQI) guidelines for bone metabolism and disease in chronic kidney disease (CKD) (8) and assuming a conversion factor of 2 between intact and biointact PTH (12), target ranges for PTH were defined as follows: Stages 1 and 2 CKD: 3 to 40 pg/ml; stage 3 CKD: 20 to 40 pg/ml; stage 4 CKD: 40 to 60 pg/ml; and stage 5 CKD: 80 to 160 pg/ml. It should be acknowledged that these targets are largely opinion based and, so far, not supported by outcome studies. Serum creatinine (Cr); Ca; phosphorus (PO4); total alkaline phosphatases (AP); immunosuppressive drug trough levels; and urinary Cr, Ca, and P were measured using standard assays. Serum albumin was measured by the bromcresol green method. The measured serum Ca levels were adjusted to albumin levels as follows: Cac = measured Ca levels + [4.0 − albumin levels (g/dl) × 0.8] mg/dl (8). The estimated GFR (eGFR) was calculated using the Cockcroft and Gault equation. The fractional excretion of Ca (FECa), which standardizes Ca excretion for differences in overall urine concentration and the contemporaneous serum Ca, was the primary measure of renal Ca handling. FECa was calculated as follows: (UCa× PCr)/(PCa× UCr), where U and P are the urinary (24-h urine collection) and plasma concentration, respectively. The fractional excretion of PO4 (FEPO4) was calculated analogously. Routine outpatient follow-up consisted of thrice-, twice-, and once-weekly visits during the first, second, and third postoperative months, respectively. Renal function, immunosuppressive trough levels, and serum minerals were monitored at all visits. All patients were followed for 13 wk. For each individual, the serum Ca peak (Capeak) and PO4 nadir (PO4nadir) within this period were identified. For descriptive purposes, data were grouped and averaged per week, relative to the time of transplantation. These week averages were used to calculate the prevalences (week-prevalences) of hypercalcemia (serum Ca >10.3 mg/dl) and hypophosphatemia (serum PO4 <2.3 mg/dl). 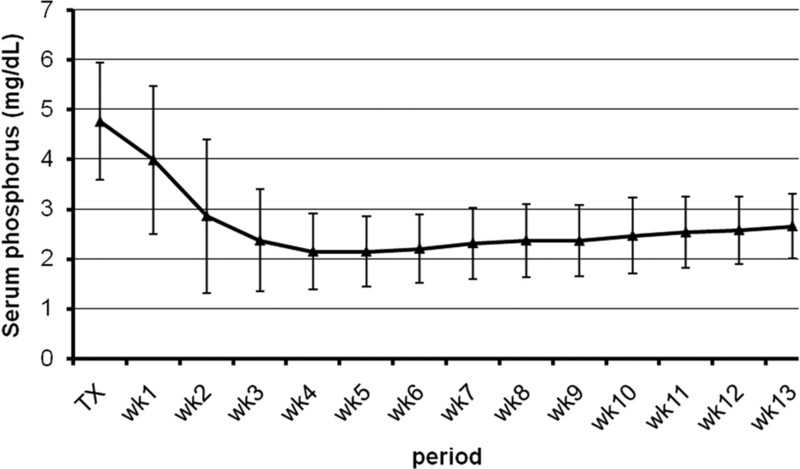 As Ca levels showed an important drop within the first posttransplantation week, the serum Ca and albumin levels within this period were also grouped and averaged per day, relative to the time of transplantation. For each individual, we identified the serum Ca nadir within the first postoperative week (Canadir wk1). To evaluate whether the prevalence of posttransplantation hypercalcemia had changed over time, serum Ca levels were compared with those observed in historic control subjects (i.e., patients who had undergone transplantation between 1989 and 2002 ). Because albumin levels were not routinely assessed in the historic control subjects, this analysis included only uncorrected serum Ca levels. The median biointact PTH level in the historic control subjects amounted to 64.8 ng/L (23.7 to 151.0) at the time of transplantation. Parametric and nonparametric parameters are expressed as mean ± SD and median (interquartile range), respectively. Differences between periods were analyzed using the Wilcoxon signed rank test and paired t test, as appropriate. Simple and multiple linear regression analyses were used to examine the associations between parameters. Nonparametric distributed analytes, including PTH, calcidiol, and calcitriol, were ln-transformed to achieve normality for the regression analyses. SAS 9.1 (SAS Institute, Cary, NC) software program was used for the statistical analysis. Two-sided P < 0.05 was considered statistically significant. A total of 201 recipients of a kidney transplant were enrolled. Demographics and treatment regimen are summarized in Tables 1 and 2. Phosphate binder and vitamin D therapy was interrupted for all patients at the time of transplantation. Table 3 shows the natural history of parameters of mineral metabolism after successful renal transplantation. All parameters showed significant changes after transplantation. PTH levels above targets were observed in 36 and 42% of the patients at the time of transplantation and at month 3, respectively. Seventy percent of the patients with hyperparathyroidism at the time of transplantation showed PTH levels above target at month 3. Patients with persistent hyperparathyroidism at month 3 were characterized by lower serum PO4 levels (2.40 ± 0.60 versus 2.80 ± 0.60 mg/dl; P = 0.0002), higher serum Cac levels (9.6 ± 0.6 versus 9.3 ± 0.5 mg/dl; P = 0.02), higher serum AP levels (215 ± 110 versus 193 ± 122 IU/L; P = 0.002), and higher FEphos (49 ± 18 versus 40 ± 16%; P = 0.02). Table 4 demonstrates pretransplantation factors associated with posttransplantation PTH levels. In the multivariate model, only pretransplantation PTH level was found to be independently associated with posttransplantation PTH (R2 = 0.27, P < 0.0001). Calcitriol deficiency was observed in 45 and 8% of the patients at the time of transplantation and at month 3, respectively. Calcidiol stores were sufficient (>30 ng/ml) in the majority (53%) of patients at the time of transplantation. At month 3, conversely, 65% of the patients demonstrated calcidiol insufficiency (10 to 30 ng/ml). Severe deficiency (<10 ng/ml) was present in another 8%. Given the widely known seasonal variations in vitamin D, it is important to emphasize that the distribution of patients over both seasons (winter and summer) was similar at time of transplantation and at 3 mo. Table 5 demonstrates factors associated with posttransplantation calcitriol levels. In the multivariate model, increased levels of posttransplantation PTH and calcidiol levels, higher eGFR, and female gender were found to be independently associated with posttransplantation calcitriol (R2 = 0.18, P < 0.0001). Figure 1 shows the time course of serum albumin, Ca, and Cac within the first postoperative week. Albumin concentrations markedly decreased shortly after transplantation and tended to increase thereafter. Both Ca and Cac showed a highly significant (P < 0.0001) decrease on the first postoperative day (Ca −1.6 ± 0.6 mg/dl; Cac −0.9 ± 0.6 mg/dl), corresponding to a decrease by 16.5 ± 5.9 and 9.2 ± 5.8%, respectively. Both low pretransplantation PTH and high pretransplantation Ca levels were found to be independently associated with a pronounced Ca decrease on the first postoperative day (R2 = 0.31, P < 0.0001). Opposite to serum Ca levels, Cac levels returned rapidly to preoperative values. Hypocalcemia, defined as a serum Cac level <8.4 mg/dl was observed in 41.2% of the patients. Severe hypocalcemia, defined as a serum Cac <8.0 mg/dl was observed in 20.3%. A low pretransplantation PTH was found to be an independent predictor of severe hypocalcemia. 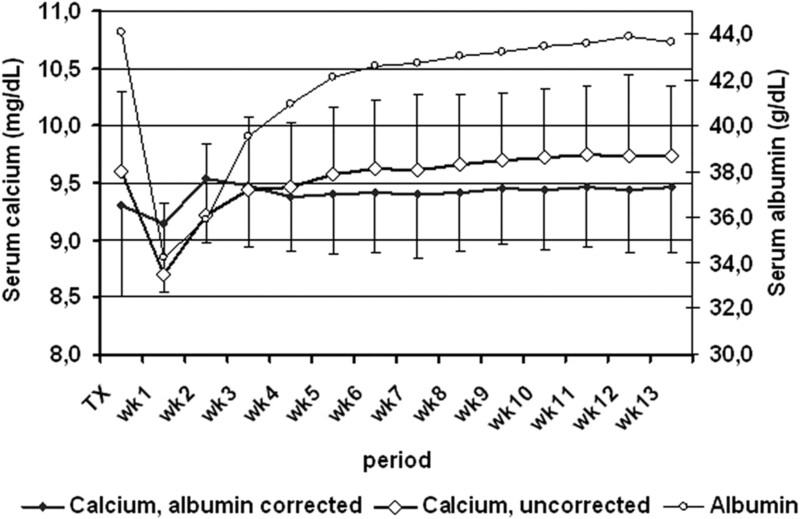 Time course of serum albumin, calcium (Ca), and albumin-corrected Ca within the first week after successful renal transplantation. Figures 2 and 3 show the time course of serum PO4, albumin, Ca, Cac, and Cr within the first 3 mo after successful renal transplantation. The time course of Ca and Cac showed marked differences. The time course of serum Ca was characterized by a dip in the first postoperative week, followed by a steady increase being most pronounced during the first month. The serum Cac concentrations, conversely, showed an increase in the second postoperative week and remained stable thereafter. The time course of serum Ca paralleled that of serum albumin. The serum Ca level reached a peak of 10.1 ± 0.6 mg/dl at week 9 ± 3. The serum Cac level reached a peak of 9.8 ± 0.5 mg/dl at week 5 ± 3. 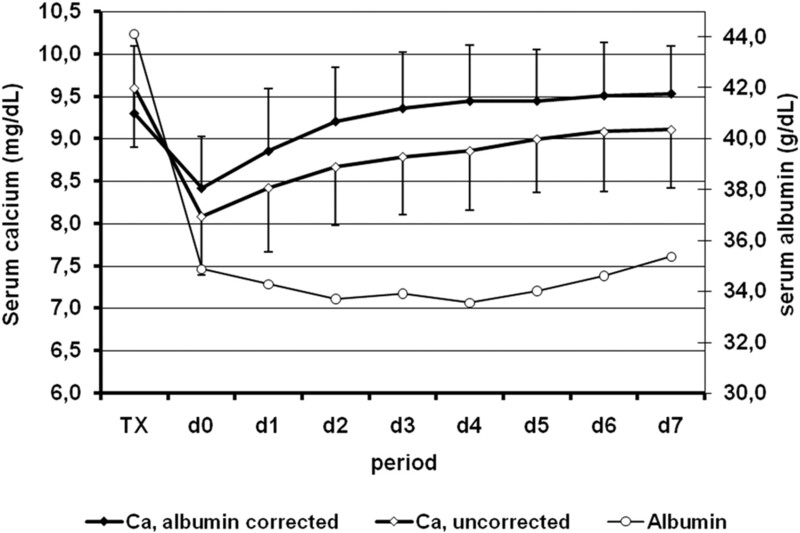 Time course of serum albumin, Ca, and albumin-corrected Ca within the first 3 mo after successful renal transplantation. Time course of serum phosphorus within the first 3 mo after successful renal transplantation. Hypercalcemia, defined as serum Ca or Cac levels >10.3 mg/dl, was observed in 27 and 14% of the patients within the first 3 mo after transplantation, respectively. The week prevalences of hypercalcemia defined as a serum Ca level >10.3 mg/dl ranged between 0 and 18%. The week prevalences of hypercalcemia defined as a serum Cac levels >10.3 mg/dl, conversely, ranged between 3 and 9% (Figure 4). Beyond week 1, hypercalcemia was more prevalent when considering Ca as compared with Cac (McNemar, all P < 0.0001). Prevalence of hypercalcemia defined as a serum Ca or Cac >10.3 mg/dl within the first 3 mo after successful renal transplantation. *P < 0.05 case patients versus historic control subjects. Patients with serum Cac levels >10.3 mg/dl at month 3 (n = 14) were characterized by lower serum PO4 levels (2.20 ± 0.65 versus 2.70 ± 0.64 mg/dl; P = 0.008), higher PTH levels (73.7 [41.0 to 97.3] versus 35.2 [20.5 to 56.5] ng/ml; P < 0.05), higher AP levels (244 ± 82 versus 195 ± 113 IU/L; P = 0.002), higher fasting urinary Ca concentration (6.0 [4.3 to 7.5] versus 2.8 [1.6 to 4.8] mg/dl; P < 0.01), and higher fasting FECa (1.28 ± 0.52 versus 0.76 ± 0.66%; P = 0.001). Table 6 demonstrates pretransplantation factors associated with posttransplantation Cac levels. In the multivariate model, pretransplantation Cac and PTH levels were found to be independently associated with posttransplantation Cac levels. These variables explain 37% of the variation of posttransplantation Cac levels (P < 0.0001). Table 7 demonstrates posttransplantation factors that were associated with posttransplantation Cac levels. In the multivariate model, posttransplantation PTH and eGFR were found to be independently associated with posttransplantation Cac. These variables explain 13% of the variation of posttransplantation Cac (P < 0.0001). The median 24-h calciuria amounted to 61 mg (30 to 98). The 24-h calciuria was positively correlated with eGFR, 24-h phosphaturia, and serum Ca level (data not shown). The 24-h FECa amounted to 1.20 ± 1.02%. The serum Ca level in the historic control group reached a peak of 10.3 ± 0.7 mg/dl at week 8 ± 3 after transplantation. Hypercalcemia was observed in 41% of the patients in the early posttransplantation period (P < 0.0001 versus cases). Hypercalcemia was more prevalent in the historic control group as compared with the current cohort (Figure 4). The major findings of this study are as follows: (1) Serum Ca levels follow a biphasic pattern during the first 3 mo after successful renal transplantation, with an immediate postoperative decline followed by a significant increase, and (2) pretransplantation parathyroid function is an important predictor of Ca metabolism after transplantation. Ca in blood exists in three distinct fractions: Protein-bound Ca (40%), free (formerly called ionized) Ca (48%), and Ca bound to inorganic anions (12%). Free Ca is physiologically active and under homeostatic control but is not routinely determined because of technique-related limitations (time-consuming, expensive, low reproducibility); therefore, total Ca is routinely measured. The latter does reflect the measured levels of free Ca if plasma levels of protein are normal. It is accepted that if albumin levels decrease, then a correction of the measured serum Ca levels should be made (8). This correction is of utmost importance in longitudinal studies that assess Ca homeostasis under condition of changing albumin levels, as is the case in the early posttransplantation period. Indeed, in this study, serum albumin levels fell early after transplantation, recovered by week 4, and stabilized at week 8 at levels of approximately 43.5 g/L. Dilution (volume expansion) and increased degradation triggered by the high dosages of corticosteroids (13) most probably explain the decline in the albumin serum levels in the immediate postoperative period. For sake of clarity, only albumin-corrected serum Ca levels are discussed, unless otherwise stated. The observation of a significant decrease of serum Ca levels within the first postoperative day is remarkable and has not been reported so far. This decrease resulted in transient hypocalcemia in 41.2% of the patients. Obviously, in these patients, normal defense mechanism against hypocalcemia failed to overcome the falling exogenous Ca supply in the immediate postoperative period. Bone is the primary reservoir for Ca and PO4; therefore, bone remodeling is critical in maintaining normal mineral homeostasis and in responding to both acute and chronic changes in serum mineral levels. It is interesting that the decline of serum Ca levels was most pronounced in patients with low PTH levels at the time of transplantation. Assuming that low PTH levels are a surrogate marker of low bone turnover (14), this observation supports the notion of an impaired mineral-mobilizing capacity in patients with low bone turnover. Urinary Ca losses, unfortunately, were not quantified in the immediate posttransplantation period. A subgroup analysis of patients with delayed graft function, however, revealed similar findings as those observed in the overall cohort, thereby questioning the clinical relevance of renal losses within this period (data not shown). Hypocalcemia may cause prolongation of the QTc interval and QTc dispersion. Both electrographic abnormalities have been shown to be independent risk factors of increased cardiovascular mortality in patients with preexisting cardiovascular diseases (15). Hypocalcemia may thus predispose to ventricular arrhythmias and sudden death, especially in cardiovascular-vulnerable patients (16,17). After the initial fall, serum Ca levels showed a stepwise increase in the second postoperative week and remained stable thereafter. Overall, this increase was significant but modest. Fourteen percent of the patients encountered at least one episode of hypercalcemia in the early posttransplantation period. Prevalences of posttransplantation hypercalcemia reported in the literature vary between 5 and 66% (2–5). Differences in diagnostic criteria (cutoff level, corrected versus uncorrected Ca, point versus period prevalence rates), case mix, and study era may have contributed to this wide variation. When considering uncorrected Ca, 27% instead of 14% of the patients in this study encountered an episode of hypercalcemia. It is accepted that persistent hyperparathyroidism plays a central role in the pathogenesis of posttransplantation hypercalcemia.(2,18,19). Our data support this notion and provide clues toward the underlying pathophysiologic mechanisms, which, thus far, have remained poorly understood. First, fasting FECa was found to be significantly higher in patients with hypercalcemia, despite these patients’ having higher PTH levels. This observation suggests that the suppression of tubular Ca reabsorption mediated through activation of the Ca-sensing receptor exceeds the PTH-mediated stimulation in the early posttransplantation period (20). Contrary to our findings, Cundy et al. (2) reported a modest but significantly higher tubular Ca reabsorption in nine patients with hypercalcemia as compared with 20 patients with normocalcemia. It is of note that these renal transplant recipients were studied 15 mo (range 4 to 72) after engraftment, which may explain the discrepancy. Additional longitudinal studies that include a large number of patients are required to clarify this issue. Second, calcitriol levels did not differ between patients with hypercalcemia and normocalcemia. This renders very unlikely the hypothesis that high PTH levels cause hypercalcemia by increasing calcitriol synthesis (21) and thereby stimulate gastrointestinal Ca absorption (22). This hypothesis has also been refuted by formal absorption studies in renal transplant recipients (2). Finally, serum AP levels were significantly higher in patients with hypercalcemia, suggesting increased bone formation (and turnover) in the latter patients. These three findings suggest that PTH-mediated Ca release from the skeleton (23) is the most plausible mechanism underlying posttransplantation hypercalcemia. Our data are in accordance with previous Ca kinetic studies of maintenance dialysis patients that showed a significant and direct relationship between serum PTH levels and plasma Ca efflux (24). It should be noted that the variables assessed in this study explain less than half of the variation of the serum Ca level at month 3. The impact of other variables such as Klotho, fibroblast growth factor 23, and calcitonin remains to be explored (25). Hypercalcemia should not be considered an innocent complication, because it may impair graft function either acutely by inducing vasoconstriction (18) or chronically (26) (e.g., by mediating calcification of the tubulointerstitium ). Moreover, hypercalcemia may confer an increased risk for soft-tissue and vascular calcification (28), which in turn may adversely affect patient outcome. Awaiting the results of additional prospective outcome studies, normocalcemia should be aimed for. Control of serum Ca may be achieved by a parathyroidectomy, but this often occurs at the expense of transient or persistent hypoparathyroidism (29,30). Data from several small series indicate that the calcimimetic treatment might be an attractive alternative for the treatment of hypercalcemia in renal transplant recipients (31–37). Hypercalcemia was less prevalent in this cohort as compared with a historic control group from the same transplant center. This beneficial evolution most probably reflects the paradigm shift in the treatment of secondary hyperparathyroidism. Despite hypophosphatemia and hyperparathyroidism, conditions that are known to stimulate increased calcitriol synthesis (21), serum calcitriol levels remain often at the lower range in the early posttransplantation period (38,39). In this study, high calcitriol levels were observed to be independently associated with female gender, good renal function, and high calcidiol and PTH levels. These data complement data from a previous study (40) and suggest that both the activity of the enzyme 25-hydroxyvitamin D-1α-hydroxylase and the availability of the precursor calcidiol are important determinants of serum calcitriol levels in the early posttransplantation period. Our data indicate that in renal transplant recipients, pretransplantation parathyroid function is an important predictor of Ca metabolism in the early posttransplantation period. High PTH levels before transplantation protect against hypocalcemia in the first postoperative week but confer risks for hypercalcemia later.